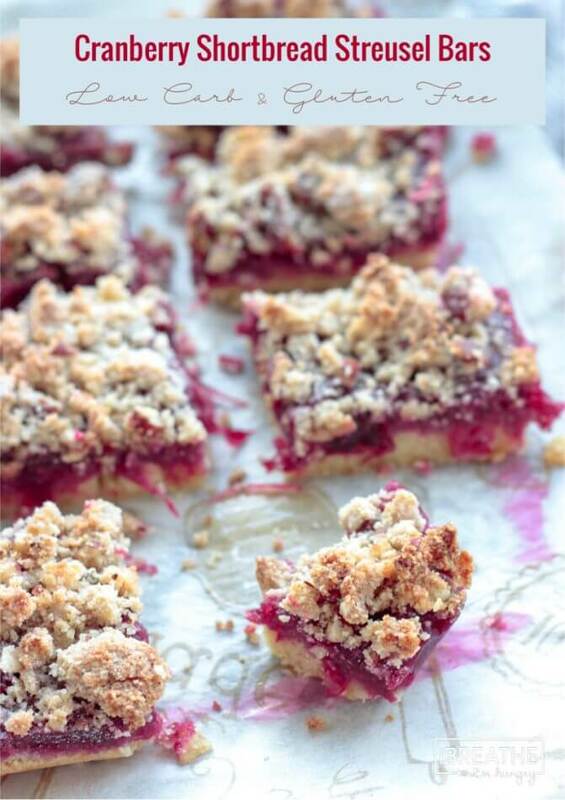 These low carb Cranberry Shortbread Streusel Bars boast a crunchy, buttery crust, topped with a sweet and tart cranberry layer and a toasty pecan streusel topping. 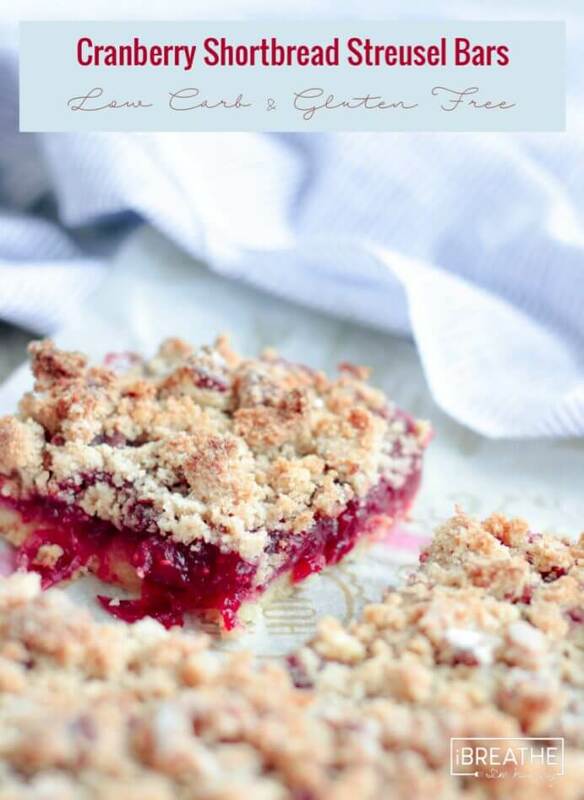 Perfect for breakfast or a sweet treat, these will be your new favorite cranberry bars! 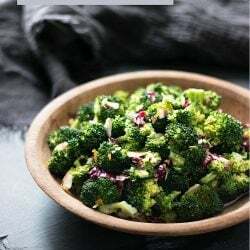 Recently a fellow low carb blogger put out a request for cranberry themed recipes for an upcoming roundup post, and I realized that I didn’t have very many to offer. There were a couple of main dishes – like these festive turkey meatballs with cranberry glaze, and my cranberry apricot glazed ham, but no baked goods or treats of any kind that celebrated the beautiful and complex cranberry! 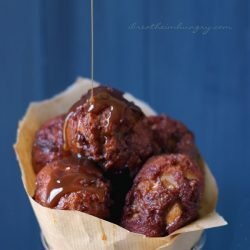 This is the kind of easy low carb cookie recipe that I just love, since I’m not about spending hours fussing over impossibly pretty baked goods that will be devoured in minutes anyway. The shortbread crust is similar to the one I use for my popular low carb Raspberry Linzer Cookie Bars, and is pressed into the pan with no rolling required. Meanwhile the cranberries are simmered on the stove until popped and thickened, then cooled slightly and spread over the partially baked crust. 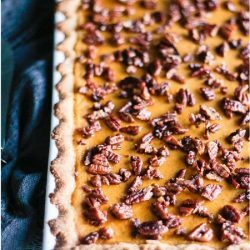 A toasty layer of lightly cinnamon flavored streusel and chopped pecans adorns the top and pulls it all together into the most satisfying cookie bar I’ve eaten in AGES. 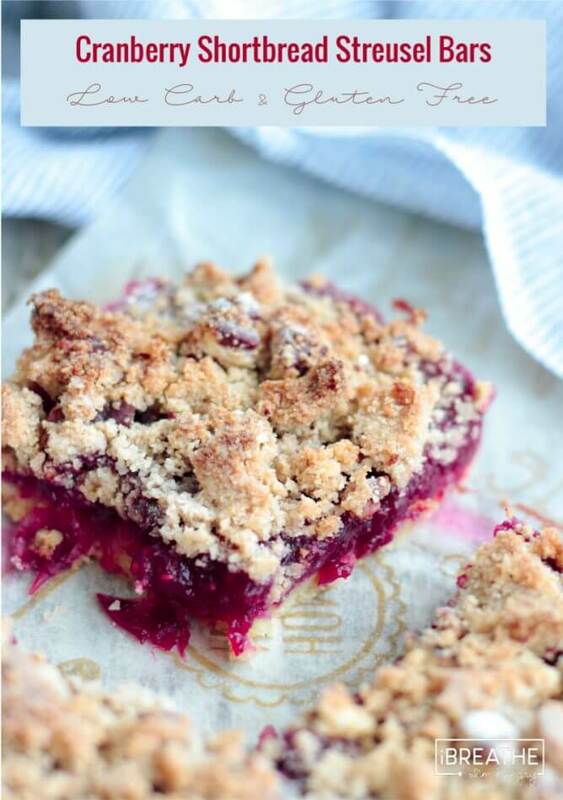 These fantastic keto cranberry shortbread streusel bars go from start to finish in less than an hour, with very little hands on time required – so you can definitely get lots of other cooking, cleaning, or Netflix binge-watching done during the process! In addition, these cookie bars freeze really well – aaaand I personally recommend going the freezing route so that you don’t eat them all in less than 24 hours. Not that I’d know from experience or anything. I used Cointreau in my cranberry jelly, which is an orange flavored liqueur. 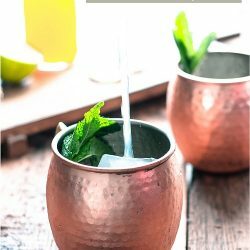 You can substitute Grand Marnier or Triple Sec, or if you prefer to leave out the alcohol (it cooks off anyway, leaving just the flavor behind), you can sub 1/2 tsp orange extract or omit it altogether! Xanthan gum is hard to get here in Belize, so I used arrowroot powder to thicken my cranberry jelly enough to set. 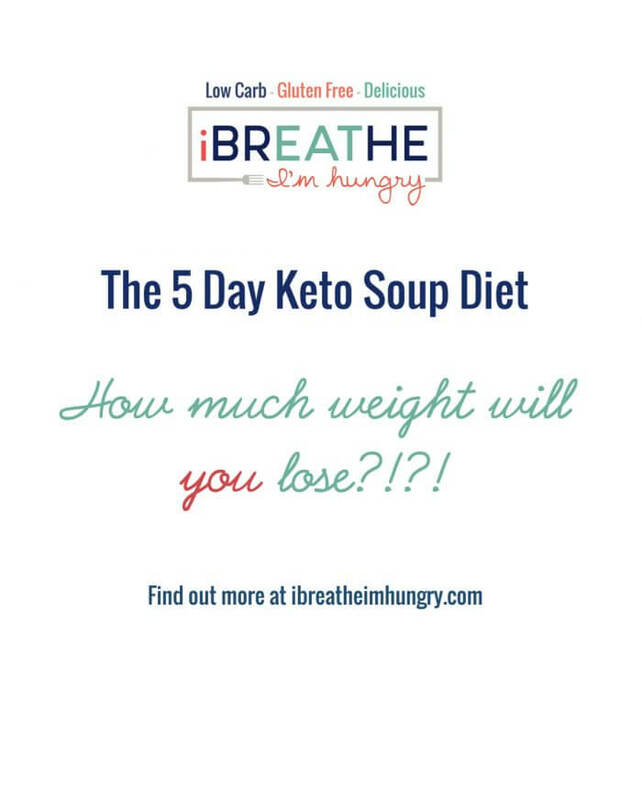 You can use an equal amount of xanthan or guar gum to get the same results. If you omit it, the recipe will still work but the cranberry layer will be a little gooier – not necessarily a bad thing! 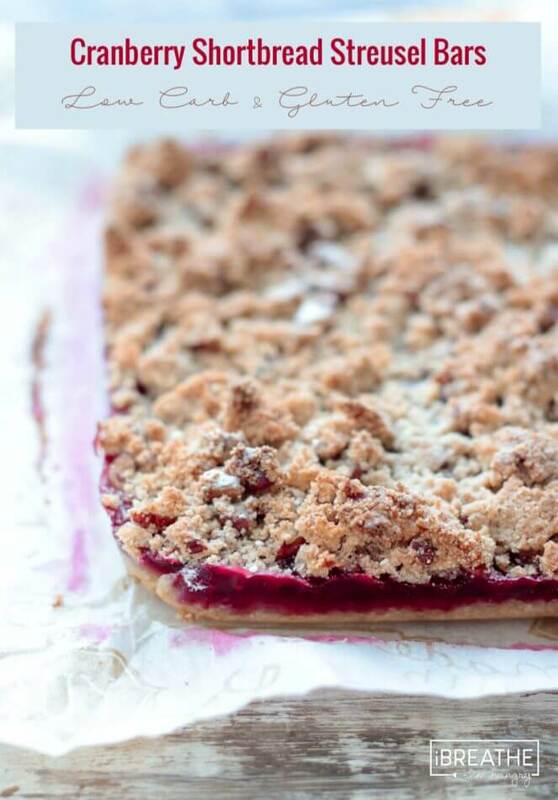 I just know you guys are going to enjoy these cranberry shortbread streusel bars as much as we did, so please make them soon and report back to let us know how it went! 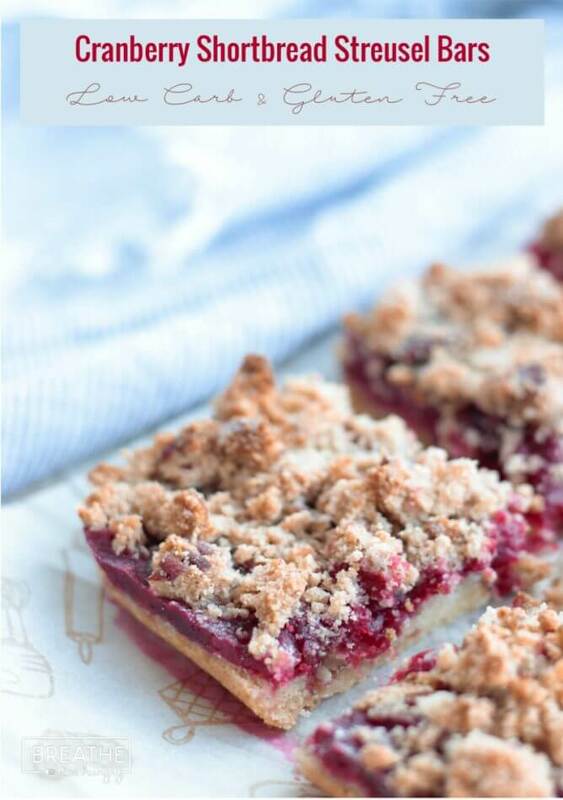 The perfect blend of sweet and tart, these cranberry shortbread streusel bars will be your new favorite keto cookie! 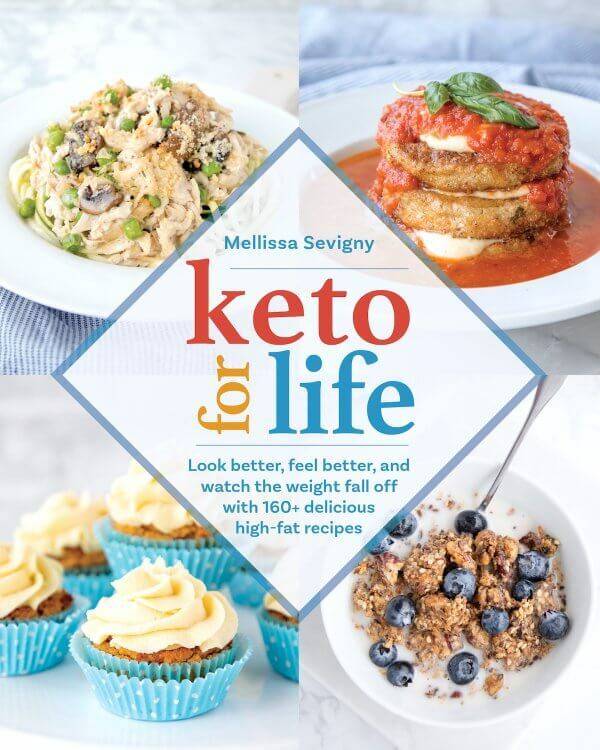 Low Carb & Gluten Free too! Combine all of the crust ingredients in a medium sized bowl and mix well with a fork. Remove approximately 1/3 of the crust mix and set aside for the streusel topping. Press the remaining 2/3 of the crust mix into an 8×8 baking pan, preferably lined with parchment or foil for easier removal after baking. Bake in a 350 degree (F) preheated oven for 5 minutes. In a small saucepan, combine the cranberries, sweetener, water, Cointreau, and arrowroot powder and stir well. Bring to a boil and then simmer on low heat for 10 minutes. Stir and pop all of the cranberries that remained whole after cooking. 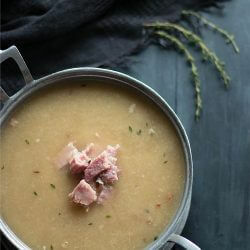 Remove from heat and cool for about five minutes, or until no longer steaming. Spread the cranberry filling evenly over the partially baked shortbread crust. Add the cinnamon and chopped pecans to the 1/3 crust mix you set aside earlier. Work with your fingers until clusters are formed. 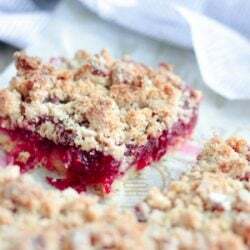 Sprinkle the streusel evenly over the cranberry layer. Bake the bars at 350 degrees (F) for 30 minutes. Just made this and it is amazing! Does this keep at room temp or frig? Also can it be frozen? I’ve been wanting to try this for a week now and kept forgetting to buy cranberries and pecans. Today we are experiencing the first snowfall of the season and it is miserable out! Perfect day for a cup of coffee and a yummy fall dessert. I decided to improvise, which I am famous for doing. I had frozen cherries in the freezer, so used those instead of cranberries. I didn’t have the orange liquer, so I substituted fresh lemon juice and no pecans, so I chopped walnuts. This is heavenly. I served it warm with a dollop of whipped cream! You are so right about having to hide it in the freezer. If I don’t, it wont last another day! I can see this as a base for many other fruits…apples, peaches, blueberries. The cherries increased the carb count, so be sure to take that into consideration! 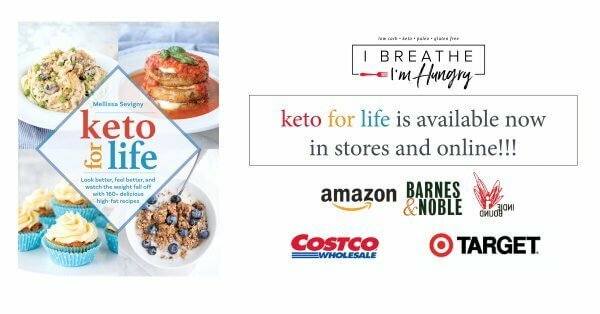 Thank you for always making me happy I have gone Keto! So happy that you were able to make these work for you Kathy! I’m dying to make them here in Honduras but they don’t have any cranberries in our grocery store yet! They DO have frozen cherries in the freezer though so I’m going to try your version! Thanks for sharing! Oh my, I used this recipe with wild organic boreal blueberries last week, and it was fantastic! I had my doubts about the simple almond flour crust, as I usually find almond flour crusts, cakes, etc. to be too heavy and oily. But these bars were just out of this world. Only one caution–even though I don’t usually care too much for sweets, I ate 11 out of 16 pieces of this in two days. Definitely need to freeze them in individual servings! Looking forward to making with cranberries as soon as they become available. YUM!!! 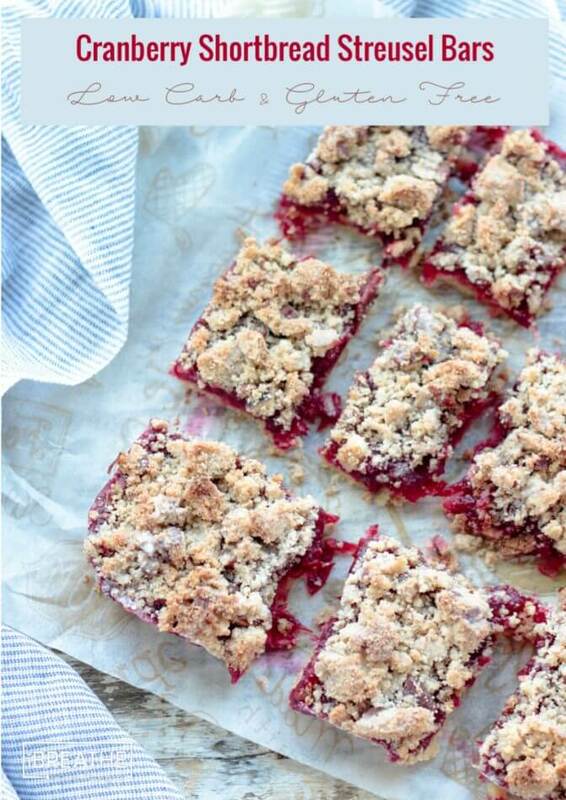 I love cranberries and could eat these bars all year long. 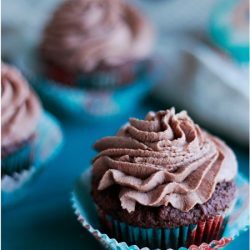 Love them and thank you for sharing this recipe. So glad you liked these Mary! They are on my list to make again soon! This looks so lovely, and not at all hard to make it looks like. 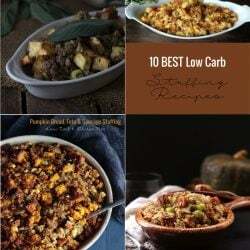 These look really good and perfect for a diabetic diet! Thank you and Happy Holidays! Oh my goodness! These look like pure perfection! I am going to make this for Christmas. I made these beautiful gems for Thanksgiving this year. It is Saturday, and there are no leftovers. For it just being the two of us, this is an amazing feat. I was asked by my other half this morning, while staring at the last two remaining bars, would I be making more today? Here I am, making more. Delicious! 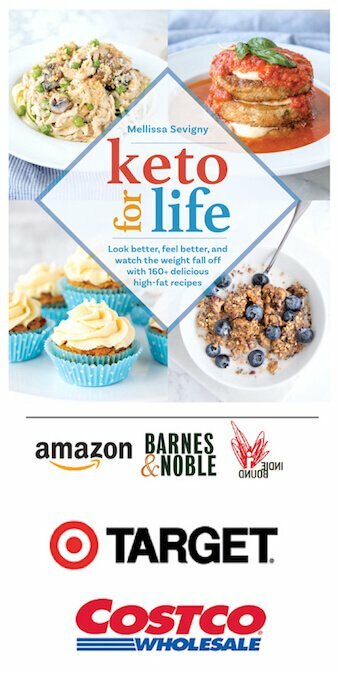 Thank you so much for your recipes, and all the tips and tricks you offer the low carb community! You are wonderful! 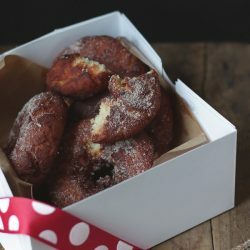 Made these last night, SO GOOD!!! That base could be used for so many yummy treats! Thanks for another great recipe!! Any recommended subs for erythritol? It really upsets my stomach. Any sweetener that measures cup for cup like sugar you can use in the same quantity as what I used for the erythritol. Xylitol maybe? This looks awesome, I bet this would be even better with cream cheese as an additional layer. I am going to try this! Looks great! Just one question you say 1/3 crust mix for the topping? is that 1/3 cup? No, it’s 1/3 of the total mix that you will make for the crust – it’s approximate so a few tablespoons either way won’t matter. Should be around a heaping 1/2 cup give or take. Hope they are a bit hit! Wow, those look good. Is this by any chance logged into MFP? I’d like to know the total carbs if possible. 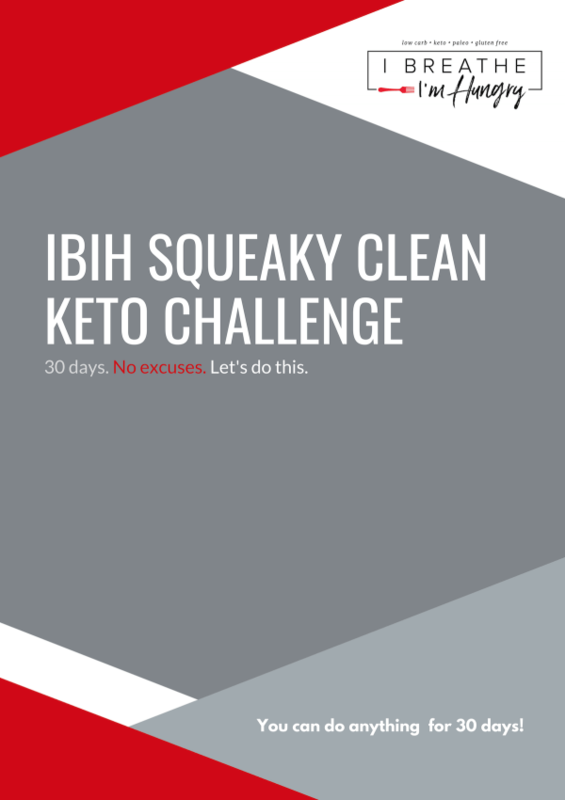 I don’t put any of my recipes into MFP but some have added them, since this is a new one I don’t think it will be there yet but feel free to add it!